According to Head Judge Mike Ryan, the top three were separated by the smallest of margins. Mr. Letoa won because his cocktails best “captured the vibrancy and exuberance of the islands of Trinidad and Tobago and of the House of Angostura®” he says. Mr. Letoa was up against 10 other top bartenders from around the world in a fierce competition which saw the contenders create spectacular cocktails using world-famous ANGOSTURA® aromatic bitters, ANGOSTURA® orange bitters, Angostura® Rums and Amaro di ANGOSTURA®. 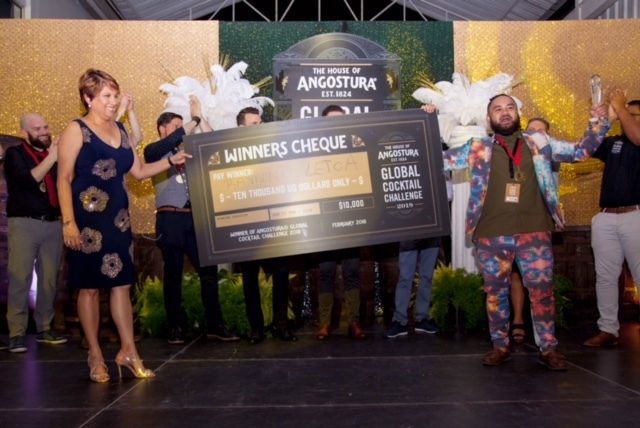 In addition to the title of Angostura® Global Cocktail Challenge Champion, Mr. Letoa takes home US$10,000 and a two-year contract as Angostura’s® Global Brand Ambassador, representing ANGOSTURA® aromatic bitters, ANGOSTURA® orange bitters, Angostura® Rums and Amaro di ANGOSTURA®. Two other trophies were awarded: Best Amaro Cocktail, to Pedro Martinez of France, representing the European Union, and Best Rum Cocktail, to Johnny Mansoor of Lebanon, representing the Middle East and African Region. For more information visit www.AngosturaGlobalCocktailChallenge.com.